The top image is a trade magazine ad. 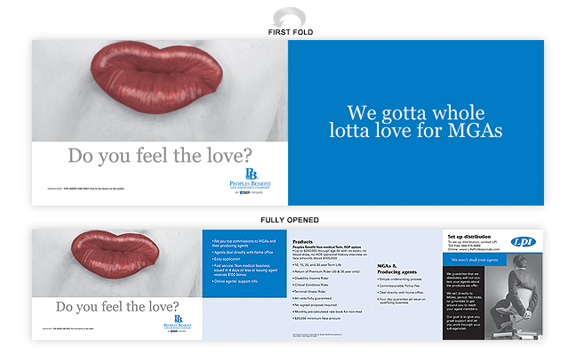 The campaign also included a brochure (middle and bottom images) that could be a self mailer or hand delivered. 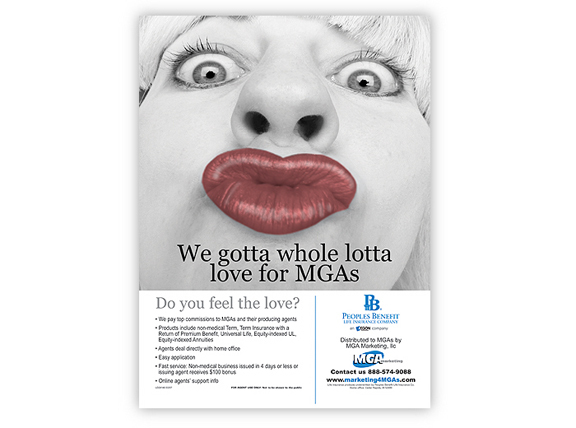 The campaign focused on the common obstacles MGAs have about working with a national distributor and larger insurance companies. Life Professionals (LPI) is a national distributor of life insurance products. They recruit insurance agency buying groups, known as MGAs, to sell these products for a number of larger insurance companies. In this case, they were recruiting MGAs for Peoples Benefit Life Insurance Company (PBL). They needed to catch the attention of the customer and give them enough information that they could arrange a first meeting. There is a tendency for MGA groups to shy away from national distributors who serve as middlemen in the distribution of products. This campaign focused on getting past these obstacles by highlighting how working with PBL through LPI was actually beneficial to the MGA. We knew that MGAs were heavy readers of specific trade publications, so we led with an ad in these magazines. 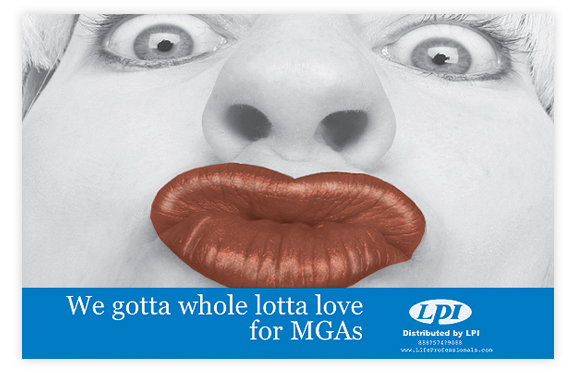 We designed a campaign around the humorous theme "We Gotta Whole Lotta Love for MGAs" with the big lipped woman coming in for a smooch! The top image is the ad we ran in insurance trade magazines. The bottom three images comprised a brochure that could either be used as a self mailer or hand delivered. Both the ad and the brochure hit the highlights of working with LPI and PBL. The humor worked well for them. In trade publications, where there are hundreds of other ads, standing out from the rest is a challenge. The "love" theme did the trick. Who could miss those lips? The brochure tied very nicely to the ad.